This bio-recipe shows how to find orthologous sequences automatically and how to use them to build a phylogenetic tree of their species. Orthologous sequences are sequences which belong to different species and have a common homologue exactly in the common ancestor of both species. Paralogous sequences are sequences which were generated by a gene-duplication event without necessarily any speciation. 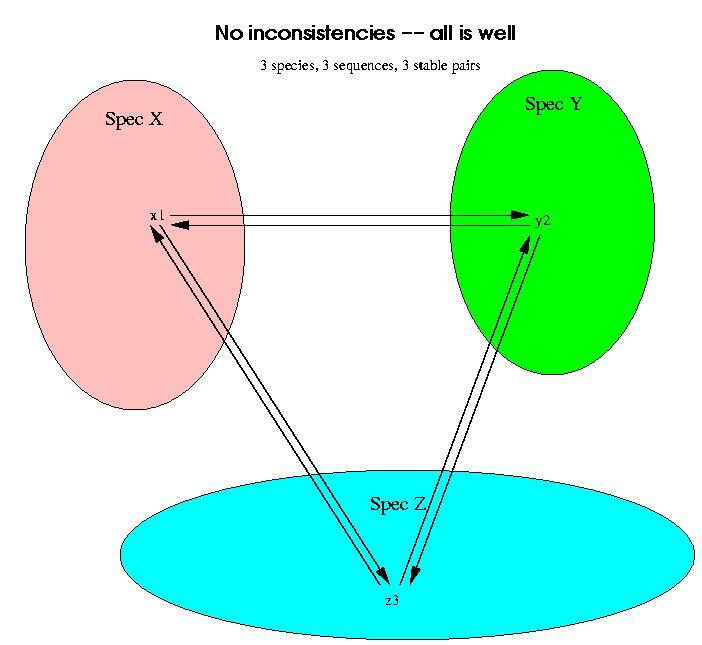 In terms of the following figure, the ellipses represent species and X1, X2 represent genetic sequences. U is the oldest ancestor, which had a single copy of the sequence X1. At some point, between U and its descendant V, a sequence duplication occurred which left two copies of X1. We label the second copy X2. Later, V speciates, that is it has two different descendants, marked A and B. A inherits both sequences X1 and X2 from V. For this example, we have made B inherit only one of the two sequences, in this case X1. X2 was lost or damaged in the evolution from V to B. Now we can say that A[X1] and A[X2] are an example of paralogous sequences.A[X1] and B[X1] are an example of orthologous sequences.More importantly, we consider that A[X2] and B[X1] are not orthologous sequences. To build phylogenetic trees we need to find orthologous sequences and estimate the amount of evolution between these sequences. Ideally we would like to work on exactly the same protein across all the family that we want to relate. This normally gives better results than using different proteins, as different proteins may be subject to different evolutionary pressures and may give inconsistent estimates of the distances between species. When we can work with the same protein in many species, many inconsistencies disappear. The most serious danger when evaluating the distance between species through sequences is to use paralogous instead of orthologous sequences. In our picture above, we could have taken B[X1] and A[X2] (which are homologous) and estimate the distance between A and B from them. This would clearly be wrong, as we would be measuring the distance between A, U and B and not A to B alone. Notice, that this mistake could easily happen if A[X1] had not been sequenced (or had been lost in evolution). The main contribution of this bio-recipe is to explain an algorithm in Darwin which detects orthologous sequences and avoids most of the paralogous ones. Once this is done, we will select a single protein to produce a phylogenetic tree. The selection of a single protein is based on the same ideas used to detect orthology, which is stable pairs. There are several important algorithmic and computational ideas which are developed here. First we read the SwissProt database and create Dayhoff similarity matrices which will be needed to align sequences. Next we define the desired taxon and collect all the species which can be found in SwissProt (i.e. that have some sequence representation in SwissProt) for that taxon. We print the common name together with the scientific name to make a short table for our own reference. Notice the use of the functions SP_Species which returns a set of species names and SPCommonName which translates a scientific name to a common name, if possible. . . . . (19 output lines skipped) . . . .
Next we compute the orthologous groups for all the sequences in all the species that we selected. This is done with a single call to Orthologues. We set the printlevel to 2 so that the function prints some information as it works. If there are many sequences involved, this procedure will be very time consuming (as an all against all matching is performed). 1 sequences of Abies alba (Edeltanne) (European silver fir). 1 sequences of Abies bracteata (Bristle-cone fir). 2 sequences of Abies firma (Momi fir). 3 sequences of Abies grandis (Grand fir). 1 sequences of Abies holophylla (Neddle fir) (Manchurian Fir). 1 sequences of Abies homolepis (Nikko fir). 1 sequences of Abies magnifica (Red fir). 1 sequences of Abies mariesii (Marie's fir). 1 sequences of Abies sachalinensis (Sakhalin fir). 1 sequences of Abies veitchii (Veitch fir). 2 sequences of Cedrus atlantica (Atlas cedar). 2 sequences of Cedrus deodara (Deodar). . . . . (27 output lines skipped) . . . .
13 sequences of Pinus sylvestris (Scots pine). 7 sequences of Pinus taeda (Loblolly pine). 1 sequences of Pinus thunbergii (Green pine) (Japanese black pine), and Pinus contorta (Shore pine) (Lodgepole pine). 1 sequences of Pinus thunbergii (Green pine) (Japanese black pine), and Pinus koraiensis (Korean pine). 74 sequences of Pinus thunbergii (Green pine) (Japanese black pine). 2 sequences of Pinus virginiana (Virginia pine). 1 sequences of Pseudolarix kaempferi (Golden larch) (Japanese larch). 1 sequences of Pseudotsuga menziesii (Douglas-fir), and Larix occidentalis (Western larch). 1 sequences of Pseudotsuga menziesii (Douglas-fir), and Pseudotsuga japonica. 4 sequences of Pseudotsuga menziesii (Douglas-fir). 1 sequences of Tsuga canadensis (Eastern hemlock). 1 sequences of Tsuga heterophylla (Western hemlock). The parameters given to the function are all the species names that we want to relate. Alternatively, the Orthologues function accepts a sequence. When a sequence is given, it searches the entire database for homologues of the sequence and the orthologous pairs are build from all the matched sequences. The result of the computation is a list of objects called OrthologousGroup each containing one independent group. The groups are ordered by decreasing size, we can look at the smallest one by looking at the last one. The OrthologousGroup contains the list of species, the list of sequences and a matrix of the all-against-all alignments. Now we will explain how the orthologous groups are found. The first concept that we define is that of a stable pair of sequences. 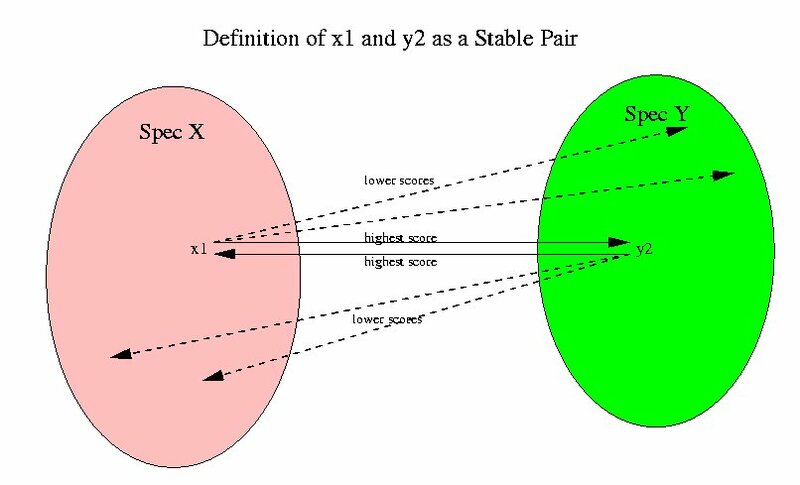 A stable pair of sequences x1, x2 between two species Spec1 and Spec2 is a pair for which x2 is the highest scoring sequence in Spec2 for x1 and vice versa. The following picture shows this relation. Since we are using Dayhoff matrices for computing the scores, the highest scoring sequences mean the highest level of confidence in homology. By performing and all-against-all alignment for all sequences in every pair of species we find all the stable pairs between pairs of species. If we compare only the proteins x1 and y2 in Species X and Y, then we might incorrectly assume that the two proteins are orthologs. By comparing with a third genome, it is obvious that this stable pair is invalid and must be broken. For the analysis of stable pairs we will work with distances instead of similarity scores, but the reasoning is analogous for both measures. We assume that all the alignments involved exist and are reliable (good quality alignments, i.e. score/confidence above certain level). We will now assume that the distance between x1 and z4 is longer than the distance between x1 and z3, i.e. 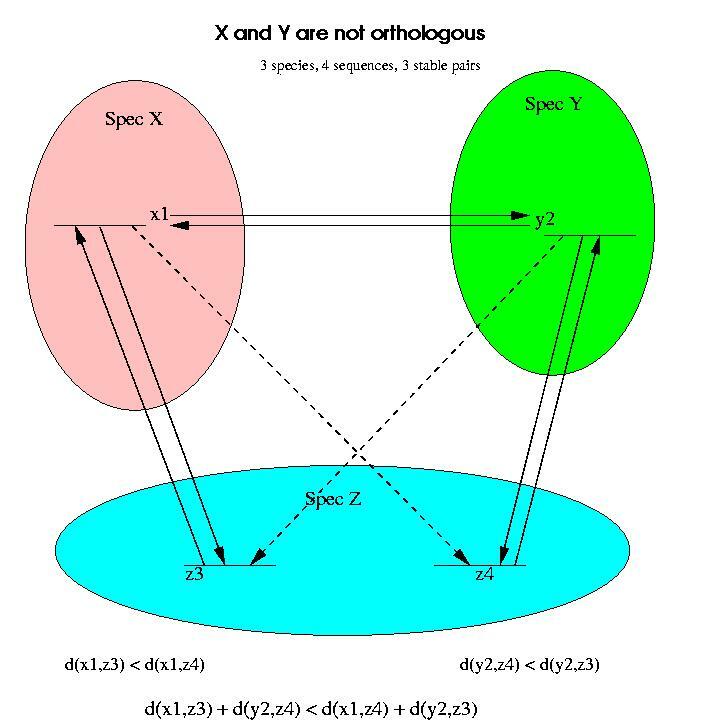 To prove that x1 and y2 are not orthologs we proceed in two steps. (a) First we determine which of the three trees on four sequences (shown in the figure below) accurately reflects the distance inequalities. Only the quartet in the middle is in agreement with the data provided. The other two contradict the distance equation (for the first the distances should be equal and for the third tree, the inequality is reversed). (b) Once the quartet is decided, we have to place the origin of life. There are five possible branches on which to place the origin of life in a quartet. This gives rise the three trees shown here. The other two trees are symmetric cases (not shown). Again we use the above inequalities and the fact that the branches from the root to the leaves must be approximately the same length to discard four of the trees. The third tree is in best agreement with the data. 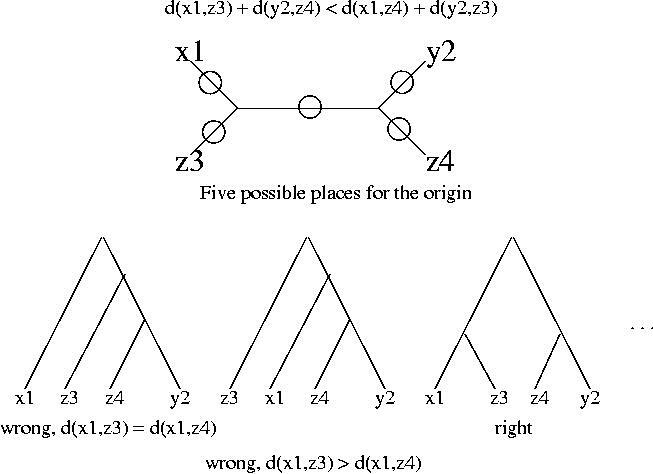 We have now the proof, the third tree shows that x1 and y2 are not orthologous. The top branch of the tree corresponds to gene duplication (it has z3 and z4 on each side), and hence x1 and y2 arose from gene duplication not speciation. In simple terms, we use a third species to detect whether pairs are orthologous or paralogous. For this procedure to be successful we need to have at least one species which has been extensively sequenced, and one species which has kept both copies of the original gene duplication. Of course, the more species that are extensively sequenced, even if those sequences end up not participating in the tree, the more credible our orthologs will be. In our example, Green pine is likely to serve as a good witness, as it has a large number of related sequences and stable pairs. The stable pairs which are not proven paralogous against all the available other species are called verified stable pairs. The final step is to use the verified stable pairs to make groups. An orthologous group has to have members which are all orthologous with each other. In terms of graphs, if each sequence is viewed as a vertex, and each verified stable pair is viewed as an edge between two sequences (vertices), then an orthologous group is a complete subgraph. In graph theory, a completely connected set of nodes is called a "clique". Finding maximal cliques in a graph is difficult (it is an NP complete problem), but for small problems like we have it is not very time consuming. Darwin implements a very effective clique approximation algorithm which runs in reasonable time. The final step of the Orthologous function is to find the maximal cliques and with each clique form a group. Once that a set of sequences is included in a group, these sequences will not participate in any other clique, that is, any sequence can appear at most once in an orthologous group. values are integers between 0 and 100, giving the confidence in percents. a list of trees from bootstapping experiments could be given as arguments. ShowBootstrap in the DrawTree function. shows that the quality of the fit is good, (greater than 1 is poor, less than 1 is good). It is just up to the biologist to confirm the quality of the tree.